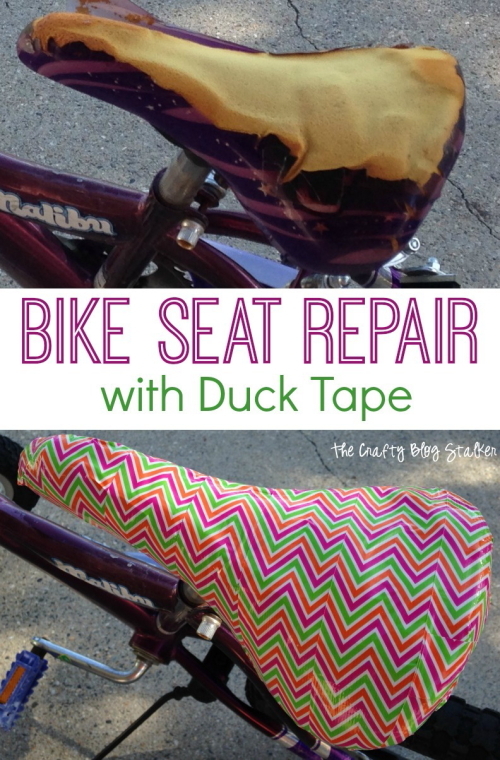 Do an easy bike seat repair with Duck Tape. An easy DIY craft tutorial idea. 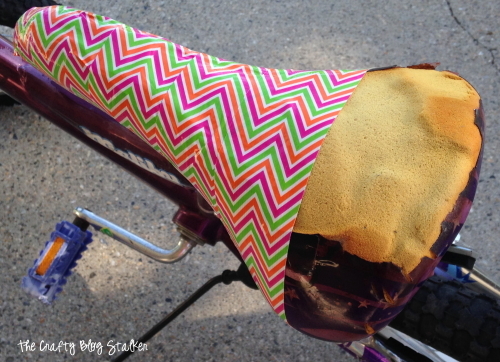 This is a fun way to decorate a bike seat too. Summer is finally here and I am so excited to be playing outside in the sun with my kids. Which means it is also time to pull the bikes out of the shed, fix those flat tires and get them ready for a summer of fun. 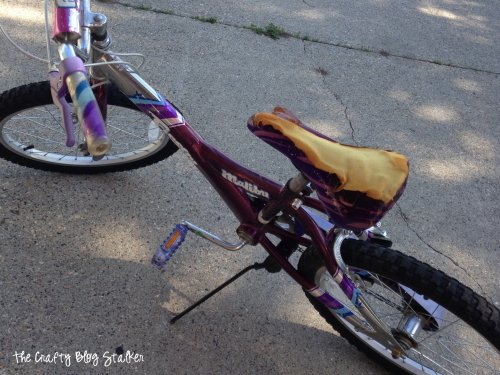 My husband is always really good at fixing the flats but when my daughter was complaining of a pinching seat and needed a bike seat repair, she was directed my way. Her bike is in good condition, and not even close to needing to be replaced. It’s just that darn uncomfortable and pinchy seat. That’s where I come in with my handy dandy Duck Tape. 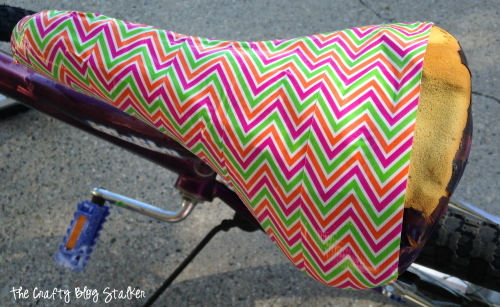 I have TONS of Duck Tape in about every color and pattern, and this is the style that my daughter chose for her new bike seat. I was a little worried about matching up the chevrons, but it was actually easier than I thought it would be. I started with the skinny end of the seat and made my way toward the fatter end. 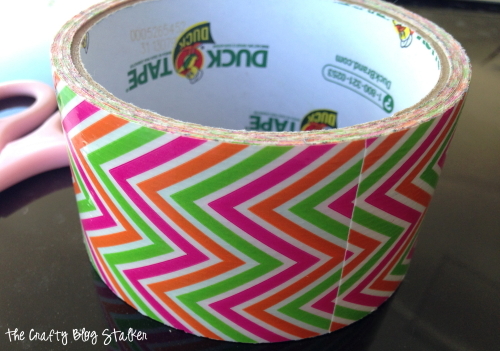 I cut the Duck Tape into strips and layered them one strip at a time. I tried to match the chevron pattern starting in the middle of the strip and then adhered the sides. The ends of the tape, I wrapped underneath and stuck to the bottom of the seat. All done! Hey, that was way easy! 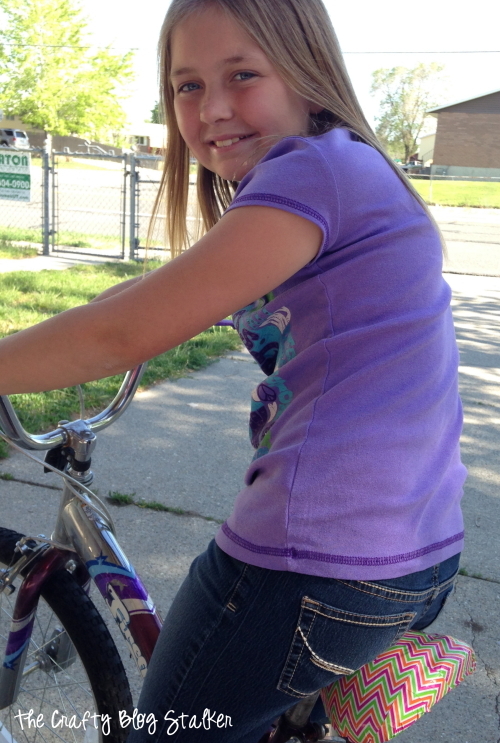 My daughter loves her new bike seat and is ready to take summer on, with a bike helmet of course! My other daughter actually wants her seat done too, and it is completely fine. Only the cool kids have Duck Tape seats! What have you fixed with Duck Tape? Share and leave a comment below! 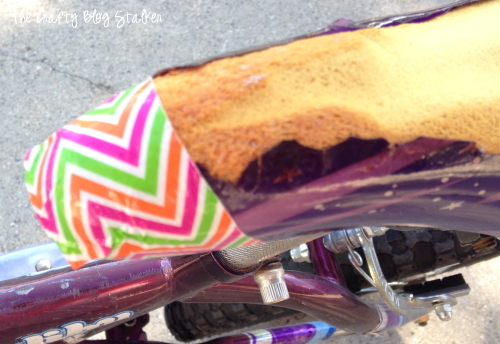 SAVE HOW TO DO A BIKE SEAT REPAIR WITH DUCK TAPE TO YOUR FAVORITE DIY PINTEREST BOARD! What a great idea–it’s cute too! Super cute and probably quite comfy! the colors make me think of summer so perfect! NICE! I love simple ways to fix things and it looks fabulous! Such a great idea! I featured you this week on The Creative Exchange Highlights. Thanks again! Aww, she looks so happy! What a great use for cute Duct tape! Pinned and Stumbled! How cool is this project! 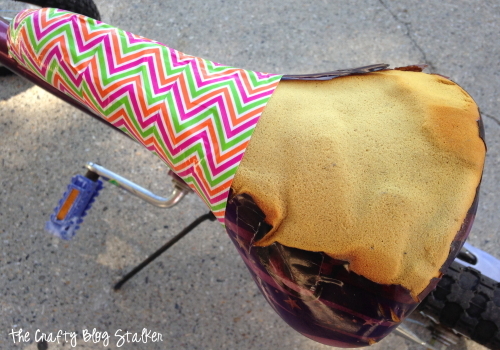 I love that you could customize your bike seat to any tape color, really! Please come share at our link party going on now. 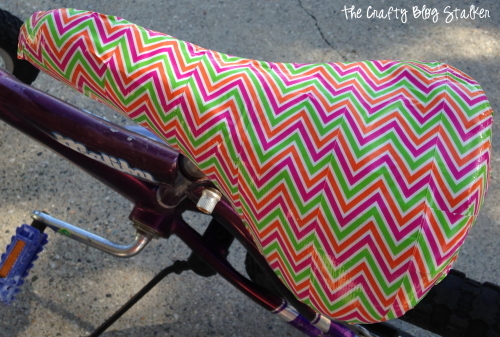 What a cool idea, would have never thought to use duct tape to repair a bike seat. That is such a great idea and it looks so pretty!! 🙂 Pinning! What a great idea and I love the pattern you chose for the seat! Stopping by from the Blogger’s Digest blog hop! Awesome repair! I need some “boy” duct tape for all that mine tear up! HA! Thank you so much for sharing your creativity with us at Show-Licious Craft & Recipe Party! Join us again this Saturday morning! Love this repair! Now I kinda want a Duck Tape seat too! lol Love it. I remember having a pinchy seat when I was a kid. Very cool life hack. Thanks so much for sharing on Inspire Me Wednesday. Featuring you in this week’s issue. Love this idea, and love the Chevron Pattern! I’ve featured it on Worthwhile Wednesdays! I love this project, what a great way to personalize your bike.